Motorists in Zimbabwe are ringing in the new year by toasting — or cursing — increased traffic fines which are expected to raise needed revenue by the cash-strapped government and reduce car accidents. Come Jan. 1, if motorists break a traffic law, they will pay as much as $700 for offenses such as speeding, drinking and driving, overloading their vehicle, or driving without a license. The previous maximum penalty was just $30. President Emmerson Mnangagwa's government says the move, besides raising revenue, will reduce fatalities on the roads. But Stanford Chigwedere, a public transport driver, says he is against the idea because casualties on Zimbabwe's roads are not caused by bad driving alone. "Roads in Zimbabwe are now useless. 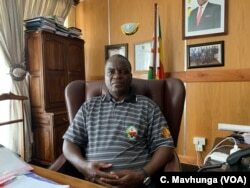 They want to fine us; we pay tax but they are doing nothing," Chigwedere said. "Now they are increasing fines to as much as $700, where will that money go to? All roads are full of potholes. We are giving them lots of money. We are not causing deaths or accidents on the roads; it is the police chasing motorists that cause accidents because we will be on these bad roads." Critics say the move is a desperate measure to squeeze money from an already overburdened citizenry. Clever Mundau says he is for the new traffic fines being introduced by the government. "I think the responsible authority have views, maybe they want the roads to be OK." Mundau said. "So they are going to make sure that the roads are OK. So let's just give them time." According to the Traffic Safety Council of Zimbabwe, major causes of road accidents include speeding and lack of discipline. Obio Chinyere, the head of the government agency, says fines by themselves will not work. "It is not only the fines when you look at the road safety, there are other instruments we can actually use, yes, the fines, but you also have to bring in education, road worthy vehicles," Chinyere said. "We are saying; yes you can make an error as you drive, if you move out of the road, it shouldn't be a death sentence, the road should be able to forgive you. Once you leave that road, you are gone." Narrow roads have also been an issue, causing some motorists to swerve and get into accidents. The government says it is embarking on a program to create four-lane roads as the current infrastructure has become dangerous after years of neglect.